GourmetGiftBaskets.com sent us a couple of their great products to review! 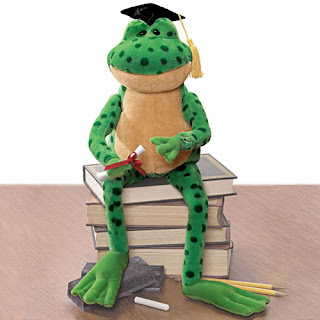 I picked the singing Graduation Frog for my son that graduates this year and also a Wrigley's Gum Basket! The Frog sings Shout and dances and is so fun! I think Gund does a great job on their animated stuffed animals! 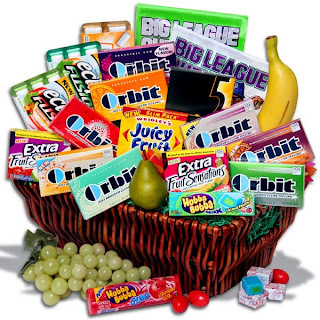 The gum basket is perfect with lots of fun sugar free gum! Perfect for me when I am craving a snack to help me be good! GourmetGiftBaskets.com has the coolest things. I was really impressed with their customer service and the selection! With Easter around the corner they have lots of fun Easter things too! Make sure and check them all out!Thanks GourmetGiftBaskets.com for the great products! 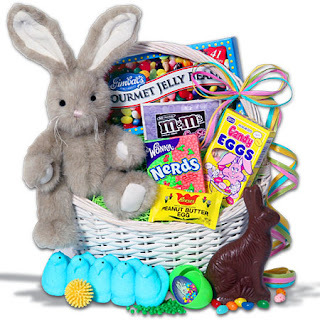 give away one Classic Easter Bunny Gift Basket! My kids are too old for Easter Baskets so this would be for me...just me!!!! What fun baskets, I love their candy bucket. I have the button for you book blog. I would love to win this!! How fun!! Thanks!! I would love to give this basket to my son! I would love to win this Easter basket! Might just have to share with the little ones in my family. I would love this, thanks. You are never too old for an Easter basket. That's a great Easter basket! I always looked forward to Easter as a child; my Mom would hide the basket and make me find it. I plan to carry on the tradition. I follow this blog publicly! thank you! I follow your Book Giveaway blog too! I went on GourmetGiftBAsket Facebook site and there really wasnt an area to JOIN, but I did leave a message! I actually looked on the site before leaving my initial comment...so I commented on the St. Pat's Beer one AND the Golf One my Father in Law would like! Went back to JOIN the GourmetGiftBasket FAcebook site! Oh count me in, this is my comment!!!! And now I am a fan on Facebook!!!!! And I voted for you, You ARE the best blog Shauna!!!! I have your book blog button! I have your button for this blog. I would love to receive this easter basket. All of their baskets are really cute. Love it. These gift baskets are just sooo beautiful! :D I'm sure it would make ANYone smile to receive one! Thans for another great giveaway! I have your Seeking Sisterhood blog button on my blog! I have your Book Giveaway Blog button on my blog! I have your Trying to Stay Calm button on my blog! I'm a fan of GourmetGiftBaskets.com on Facebook! I have three children ages 2, 3 and 4 who would love to share this basket with mommy and daddy. It is really spring like and festive looking for Easter! I am a new blog follower...thanks for the chance to win this for my family! Such great baskets - a fun gift to give or receive. Follow your blog via Google Friend Connect. Gourmet Gift Baskets have great baskets! Fun giveaway! Thanks! I have your Book Giveaway button up! I have your button for this blog up! whoops forgot to add my email! Wow, I can feel the sugar rush right now! Isn't this a cute basket, I'm not sure you would want to give that much candy to a child but Mom and Dad can help. These gift baskets are so much fun! I would love to win one! Very cool - I would love to win! Those are great looking gift baskets! What a terrific treat! Please enter my name in the drawing. GFC Follower & Google Reader Subscriber for "Book Giveaways". GFC Follower & Google Reader Subscriber for "Trying to Stay Calm"
Very cute, I'd have 4 takers at my house! This Easter Basket is adorable! Please enter me in your giveaway!